Recently, we were asked to provide a large tropical arrangement for a memorial service. We have done this on previous occasions also, but as Robyn delivered them to the church last week, she realized how stately the flowers appeared in a spiritual setting. 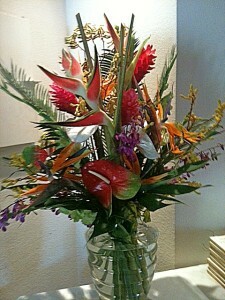 There were many birds of paradise, ginger, heleconia and orchids which stood so tall in a large glass vase. The tropical colors were very vibrant under the spotlights in the church, and as the mourners passed by, the flowers caught their attention and contributed to the honoring of the deceased. Because the stems of the ginger and birds of paradise, in particular, are so long when cut in Hilo, we recommend them for any occasion to make a significant and eye-catching creation.